Saturday morning, officials said crews were fighting 16 large fires that had burned over 214,000 acres and destroyed thousands of structures. Wildfires have consumed parts of California, and inmates are working to contain them. The California Department of Corrections and Rehabilitation runs a program called Conservation Fire Camps. It's made up of "minimum-custody" inmates that respond to fires and other emergencies like floods and earthquakes. The program is voluntary but offers incentives to inmates who join. They make $2 a day in the camps and $1 for every hour they're fighting fires. They can also get time off their sentences. California's prison fire camps date back to the 1940s and are fairly controversial. They've been cast as both beneficial job training and labor exploitation. Some have even compared them to slave labor. But officials involved with the program see it differently. A corrections spokesman told the Daily Beast, "It's difficult to call them enslaved when they're volunteering to do the job." There are reportedly over 3,000 inmates enrolled in the Conservation Fire Camps. Not all are on the front lines fighting the wildfires that have taken over California, but those who are typically clear land to help stop fires from spreading. 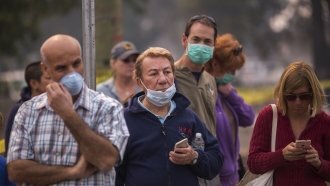 Saturday morning, officials said crews were fighting 16 large fires that had burned over 214,000 acres, destroying an estimated 5,700 homes and other structures. At least 35 people have died.